First of all, excuse the quality of the photo's, I've been an incredibly bad blogger and 'misplaced' my SD card so had to take them on my phone. This post is just a catch-up on what I am reading and will be reading throughout the year. Actually I should have put this in the photo as well - Blogs! I have become recently obsessed with reading all the blogs I follow on the Bloglovin app, it's so easy to read each new post as it comes and on the go. 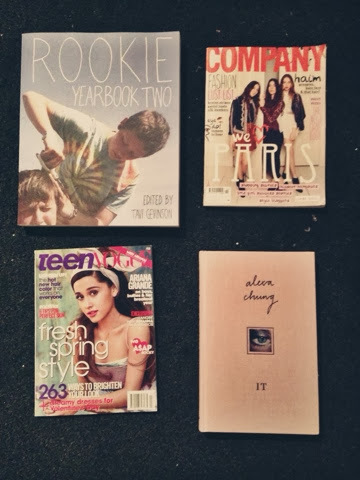 Teen Vogue - I have been subscribed to Teen Vogue since February 2011 and since then every year my grandma and grandpa get me a years subscription for my birthday. I just love every issue so much, it brightens my day when I get home and it is sitting by the door for me. I haven't fully read this issue yet but I was very happy with Ariana Grande being on the front cover as I love her album and her fashion sense, I would say she is one of my girl crush's at the moment! Teen Vogue always have such innovative idea's and this being the social media issue they seem to have exceeded my expectations once again. I'm extremely happy to have this subscription for another year. 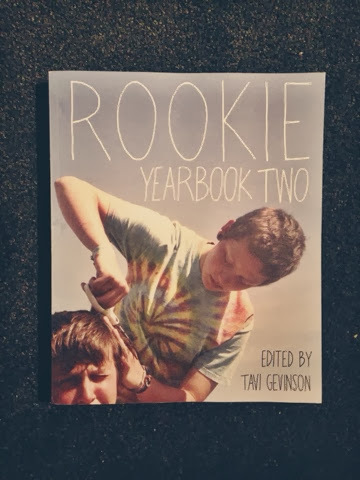 Rookie Yearbook Two - This is one of the books that whenever I see it (or the first edition) I just look over it until someone comes and pulls me away. I asked for it for my birthday after being reminded of it through Ellie's post so Madeleine and Matthew got it for me. I love it. I can't really describe how much I love it. It is supeeer thick so I haven't fully read through it yet but it seems just so cool. There are so many intriguing and thought-provoking articles and the photoshoots look amazing. The layout seems perfect and overall I'm just so excited to be able to read through this fully then have it there to come back to all the time for inspiration and shizzzz. 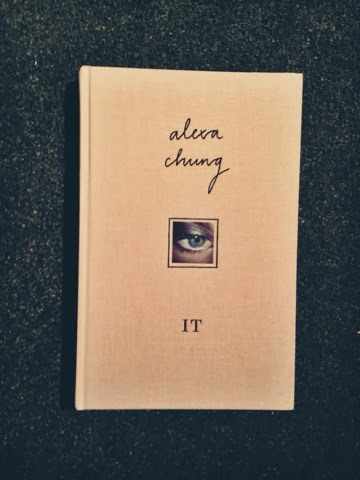 IT by Alexa Chung - I have wanted this book since before it came out and my friend Chilli got me it for our friends Secret Santa. I love Alexa and love her even more after this book. Even though its extremely random and I would say there wasn't a huge amount of content I really enjoyed it. The pictures and the insight to what Alexa Chung thinks was really interesting. I read it all in one night the first day I got it and I definitely think I already need to re-read it. Can I have Alexa's wardrobe please? Company - I've bought every issue since August 2012 and have just renewed my subscription. 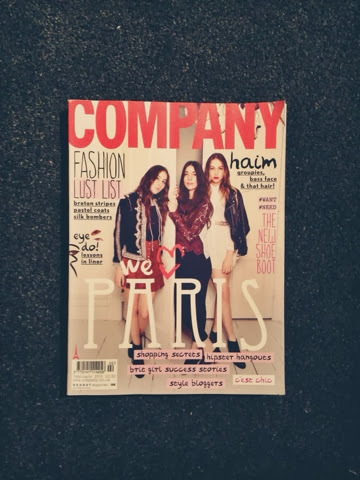 Company is such a great magazine purely for the fact that is made in London, has super cool content and is made for a target audience with bloggers (like me!) in mind. They are very present online all the time and I'm a part of the Company Collective on facebook which is a great group to be a part of to give our input whether it be cover stars, favourite bloggers or choosing the design of the spine. This Paris issue has made me want to go to Paris soooooo much. I just really want to 'pop' there for a day or so in the summer and just enjoy all the tourist-y things and then the not so tourist-y things! So that is a quick peek into my bookshelf at the moment, hope you enjoyed it and it wasn't too long and too boring!